Judging by the Cover – 10/10/18 new releases – AiPT! Jason and Eric share their favorite covers from the week’s new comic book releases. In that spirit, here are the covers that captured AiPT! Podcast host Jason Segarra and Manga Editor Eric Cline’s attention this week. So it’s Halloween season, and though I don’t read a ton of horror comics, covers like this are the type of thing to get me to start. This image is crazy evocative, with the literal darkness desperately clawing and grasping at our hero — who tells us everything we need to know about his character, perseverance, and guts through the determined look on his face in the presence of abject horror. Great work from Polumbo here. Maybe I’m just a blind fan, but I swear that the reference image for this cover is an old Tom Waits promotional photo from the ’70s. Even without that connection, this cover is definitely one that will stand out on the shelf. The series’s conceit of a widespread STD that makes its victims both beautiful and ticking time-bombs of mortality is subtly captured in this piece, and I love it. Like a lot of my picks, I feel like this one could be an art piece in someone’s home — and I appreciate art that lifts up the medium. Given the harrowing state of the country these past…almost two years (damn), this image feels really apropos. The literal symbol of American liberty on the ropes, with a tattered old glory behind him, beaten but not broken. Admittedly, I would have really preferred that Cap’s hands be bound or that he be the only thing holding up the flag (as it is, it’s sort of an Elvis “All shook up” pose), but you can’t ever bet against Alex Ross, and this is a strong image coming at a time where a lot of us need a symbol of resilience as it pertains to our country. Man is this fun. I’m a big fan of the old Tales from the Crypt comics, and this seasonal silliness is sure to put a smile on many boys and ghouls’ faces this Halloween season. John Paul Leon can do virtually no wrong in my book. The shadows here look great, especially in contrast with the bold red background. I also dig the sense of motion, as the cape pulses forward behind the batarangs and Bruce’s extended arms. All in all, this cover captures a cool moment. I dig the sense of energy here. Flash is just prepping himself to start running ahead, but you can still see his Speed Force powers flowing off him like electricity. 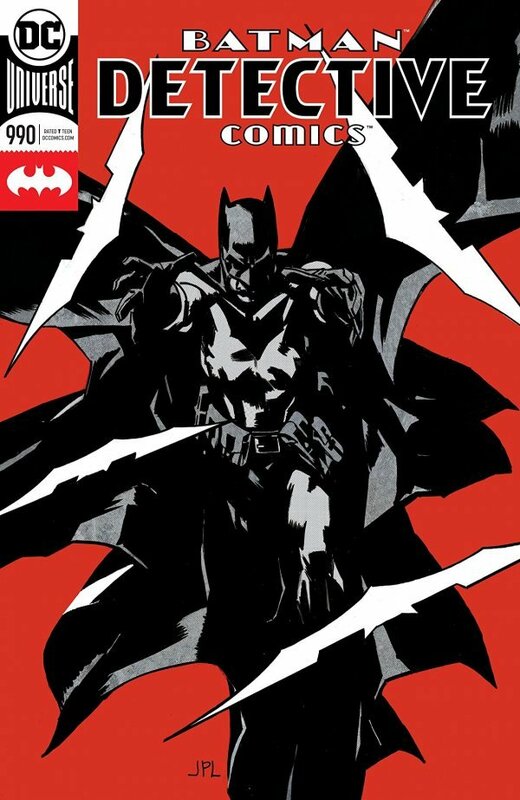 Like the Detective Comics cover above, this one makes great use of its red, black, and white color scheme. I like the sense of comfort and compassion here. The posing is simple and effective, and it leaves me curious to see what happens in this issue. Of course, Forbes’s colors are also lovely as always.